Apply to be a part of Got Muscle Team! It’s not Just work with Got Muscle. It’s passion, its a lifestyle. Experience an inspiring career opportunities and unlimited potential for growth with Got Muscle PT. We are a leading personal training and group fitness company that makes extraordinary differences in so many lives every day. We create an integrated approach to the life-style from personal training to our group fitness coaches. Complete the entry form located on this page to apply for a desired position. Forward your resume to our direct email GotMusclePT@gmail.com as a PDF file. Please attach copies of your certifications or degrees. Got Muscle management team will review your application, and contact you to begin the interview process. Apply to be a part of the Got Muscle Team! Got Muscle FitnessnIt’s not Just work with Got Muscle. It’s passion, its a lifestyle. Experience an inspiring career opportunities and unlimited potential for growth with Got Muscle LLC. 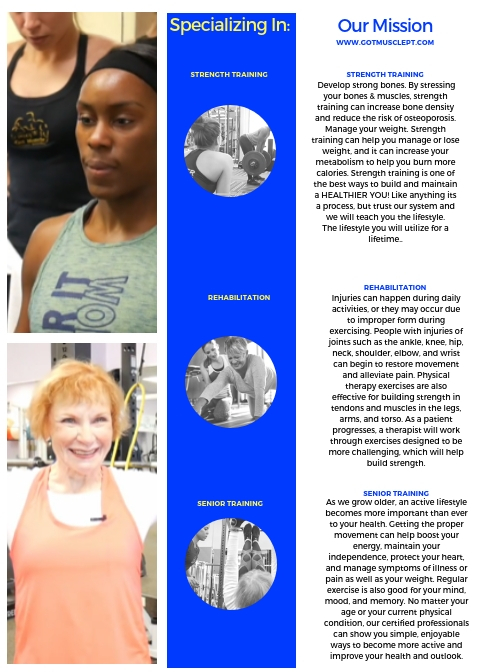 We are a leading personal training and group fitness company that makes extraordinary differences in so many lives every day. We create an integrated approach to the life-style from personal training to group fitness to our massage therapy.